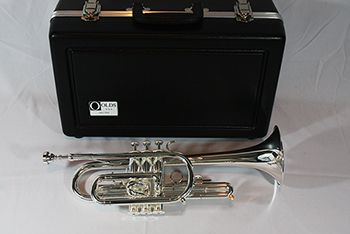 With the silver plated finish, this cornet is a variation of the NA5MU. An excellent horn to use for marching due to its striking look and brilliant sound. The 1st slide thumb saddle provides flexibility that is needed for certain passages. The molded plastic case provides protection and lightweight portability. A wonderful cornet with a silver plated finish. Grab it today!